The researchers created a mobile app, the iColour Analyser, to show that a smartphone photo of the sensor’s color bands could be used to help identify chemicals of interest, such as vapor of the explosive TNT. They described their experiments in a study published today (Tuesday, Jan. 21) in the journal Nature Communications. 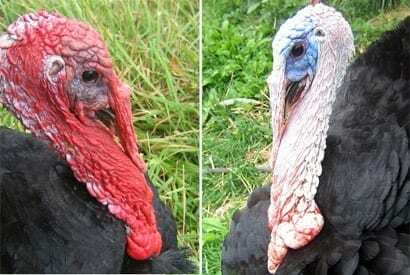 The turkey-inspired biosensors were exposed to a range of volatile organic compounds, including hexane, isopropyl alcohol and methanol, as well as TNT, at concentrations of 300 parts per billion. The researchers found that the viruses swelled rapidly, resulting in specific color patterns that served as “fingerprints” to distinguish the different chemicals tested.